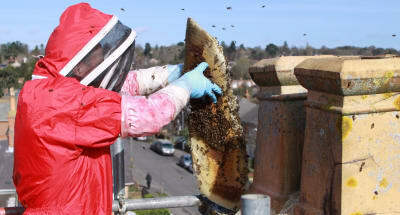 A swarm of honey bees can colonise a chimney very quickly. Initially the chimney will have been found by a scout honey bee, she will go back to the swarm and report the location as being worthy for further investigation. Additional scout bees will be sent out to make an appraisal which they do and then report back to the other bee scouts with their findings. A quorum is reached by the scout bees so deciding the best & most suitable location for them to start the new colony. Clever creatures are bees. There are only a few bees scouting the chimney at this stage and it is very unlikely that during this scouting operation anyone will have noticed the honey bees interest in the chimney. It is possible that one or two honey bee scouts may have traveled to far down the chimney and then get themselves trapped inside the house. Once trapped these honey bees would head straight for the light and if the window is open escape thru that, otherwise they will be found in the window buzzing about trying to get out until they drop with exhaustion. If you are aware of the bees in a chimney at this point it would be beneficial to treat the chimney with an aerosol insecticide as that would either deter the new scout arrivals from entering or knock down those that had already entered so preventing them reporting back to the swarm just how suitable your chimney is for them. Once the honey bees have decided that your chimney is the best location on the market, they all head off to it on mass. The honey bees arrive in their thousands very quickly and soon set up shop. They will send back guides to ensure that any lost honey bees and any stragglers can find the new home. It will not take them long to become established with new comb ready for the queen to begin laying eggs. Once she starts to lay eggs it is nigh on impossible to get the bees to move on. On arrival of the bees in a chimney sometimes but not all the time, a lot of bees will find their way down the chimney stack into the living area and again head for the windows. These days not all chimneys have open fireplaces in a lot of instances the fireplaces are blocked in or plastered over, but in instances were the honey bees have arrived and the fireplace is open then this can be a very good sign that you have had a new swarm of honey bees arrive to take up occupancy in your chimney. In an open fireplace one could try lighting a smokey fire, not a hot one. This can move the honey bees on, it maybe you have to persist with this fire for some time. If the chimney has a flue liner then this is unlikely to be effective. A honey bee smoker as owned by all beekeepers is not usually effective but well worth trying if there are no other possibilities. There are many things that can go wrong at this point for instance if the honey bees are not new arrivals but have instead been there for some time the heat from the fire could cause weakness in the comb leading it to collapsing into your fireplace along with 1000’s of live angry bees and the possibility of a chimney fire. The best solution at this point in time is to have someone physically check the chimney. 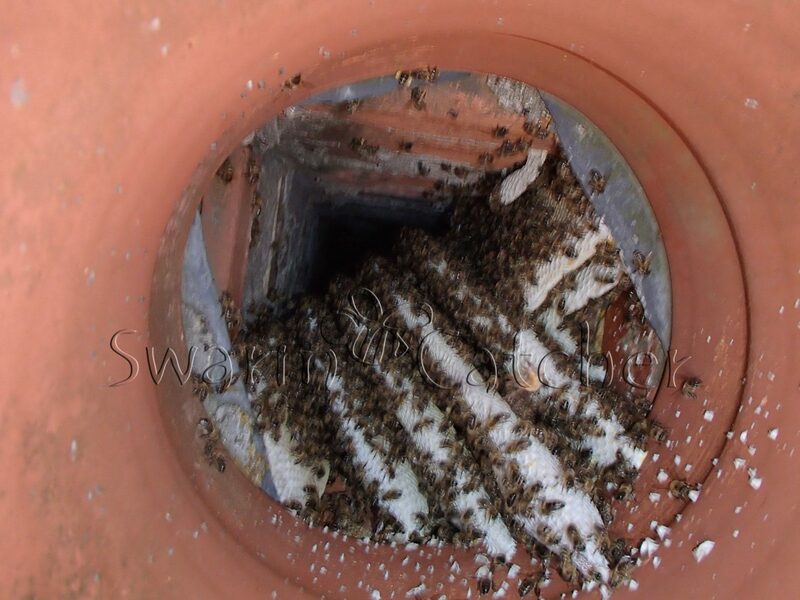 If it is a new swarm of honey bees in the chimney then they can be removed relatively easily and quickly. 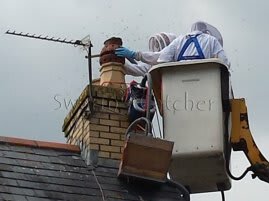 If it is an established colony then the options of how to remove bees from a chimney can be discussed and the job for removing the bees from the chimney properly planned. Best time of the year to remove these honey bees in a chimney is when they arrive, the longer you wait the more difficult and the more expensive the job becomes. Often people become aware of the bees in a chimney for the first time when an established honey bee colony has a large new emergence of bees on one of our warmer days of the year. People are out and about in the garden enjoying the weather and beauty of it all when they catch a glimpse of honey bee activity around the chimney. Its likely that this honey bee chimney colony has been there since last year and its only now that the increased bee activity is more obvious. During these large emergents of new honey bees some loose their way and head down the chimney, most probably because they have emerged at night and are heading to the light. 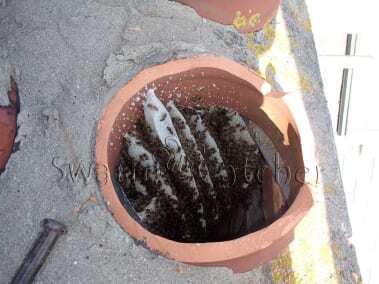 In this instance it is best to have the extent of the honey bee colony in the chimney assessed. Best way of doing this will be to directly access the top of the chimney provided there is reasonable access to assess the situation. Once the investigation is made we can discuss the options of how to best remove bees from the chimney. Best time of the year to remove these honey bees in a chimney will be discussed as part of the options available for the removal of an established honey bee colony in a chimney. Honey bees take up residence in all chimneys; in open chimneys, capped chimneys, chimneys with air vents such as the pepper pots, chimneys with gas flues running thru them, and any other possible chimney type. They seem to particularly like chimneys with blocked in fireplaces. 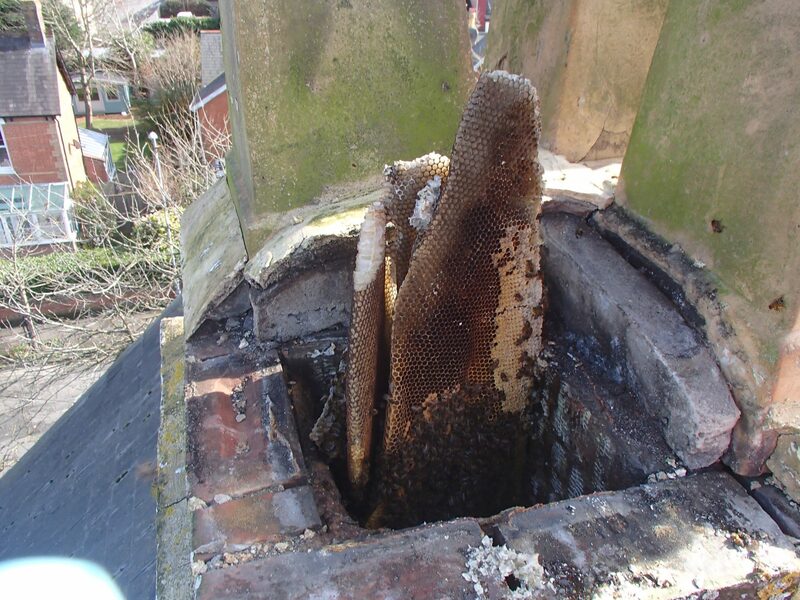 We love going to chimney bee removal jobs where the honey bees have just arrived in a chimney which has a blocked in fireplace and an open top, this is the one instance that we prefer to find blocked in fireplaces because there is no bee comb that might be dropped down the chimney. Otherwise blocked in chimneys make a honey bee removal from a chimney more difficult; the hardest part of a chimney bee removal job is preventing the falling of any honey comb if it is dropped it needs to be retrieved. In situations where bees have been in residence for a period of time having an open fireplace is very beneficial when removing a honey bee colony from a chimney. Additionally it allows for easier clean up of nest debris and dead bees that have dropped down the flue – this can often be the source of long-term cloth moth infestations. Bees tend to prefer the chimneys with blocked in fireplaces. A good situation for us to come across is a blocked in chimney that can be accessed by removing a register plate from across the lintel but is not often the case. Most blocked in fireplaces will have an airvent which more often than not will provide sufficient access once removed to clean out the debris. 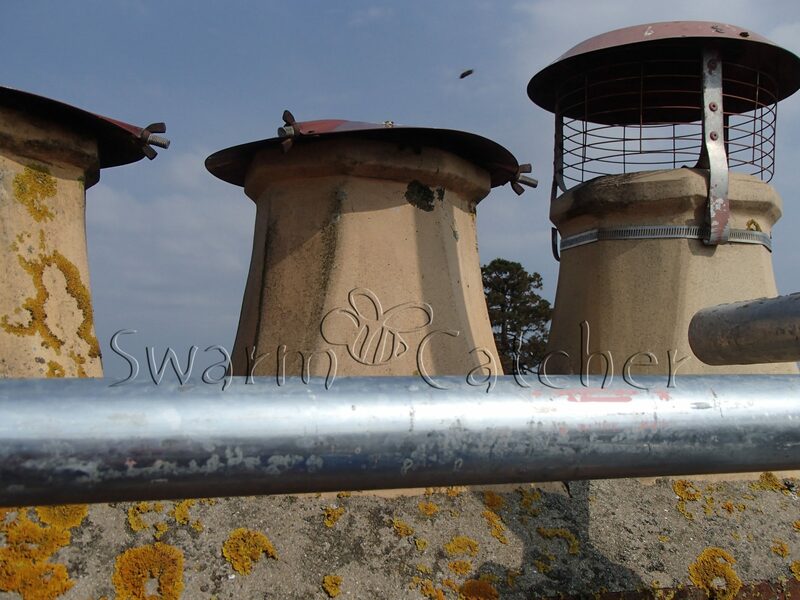 Capped chimneys or chimneys with pots require extra work to allow access to be made to honey bees in a chimney. The cap or pot will require removing, which will mean that the chimney flaunching (cement work that holds everything together at the top of the chimney and acts against the weather) will need hacking back and reinstating properly. The process of hacking back the flaunching can lead to the cracking of old clay pots and the need for them to be replaced. The worst case scenario as far as chimney type is that of the gas fire or multifuel stove with a flue liner in the chimney. 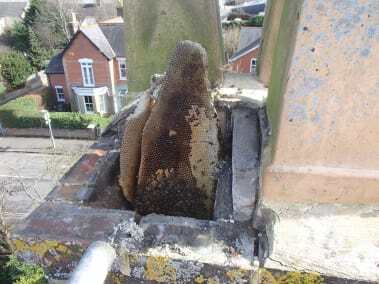 The bees in these situations are invariably located between the gas flue and the original chimney flue, allowing for very little room for us to work in when removing the honey bees from a chimney. In these situations we advise you to have a registered gas engineer or multifuel stove installer disconnect the flue so it can be easily removed from the fireplace. The flaunching at the top of the chimney will need removing and dependent upon the extent of the bee colony in the chimney the gas flue may need removing. All this because of a small hole/crack in the flaunching. If you have bees in a chimney it does not get any easier to remove them than when you use us, you can relax in the knowledge that you are in the hands of experts that are highly experienced in carrying out bee removals from chimneys and other places that bees should not be. Just call us on 02922 401649 and we will explain what we can do for you, otherwise fill in the contact form and we can call you. Honey bees are naturally attracted to environments with soot and charcoal as many beekeepers that lure swarms into old hive boxes will know. They are also highly attracted to the scent of a hive, created from all the pheromones that a Queen bee will produce and from the odours given of by the wax and propolis used in the hive. 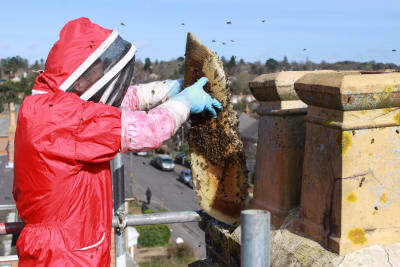 We do our utmost to catch the queen remove the bees and remove all the wax comb and propolis. However no matter what we do it is nigh on impossible to remove all the wax, or any honey that may have seeped down the chimney. These small remnants still create a highly attractive odour that will encourage other honey bees from other colonies to investigate. For this reason to prevent getting a repeat of the honey bees in a chimney it is very important to proof the chimney as best as is possible. 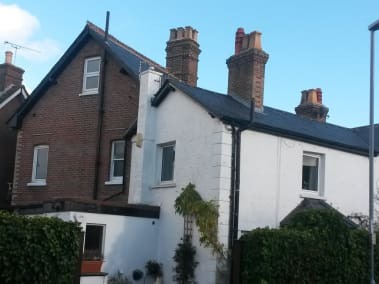 For a chimney with a gas flue inside the original flue or for a capped chimney this is very easy, it is just a question of ensuring that the flaunching and the brick jointwork is all sound. For chimneys with open fires in use there is not a lot that can be done. For chimneys that are capped with vents and the original vents are to remain in place it is better to use stainless steel mesh as opposed to insect mesh. 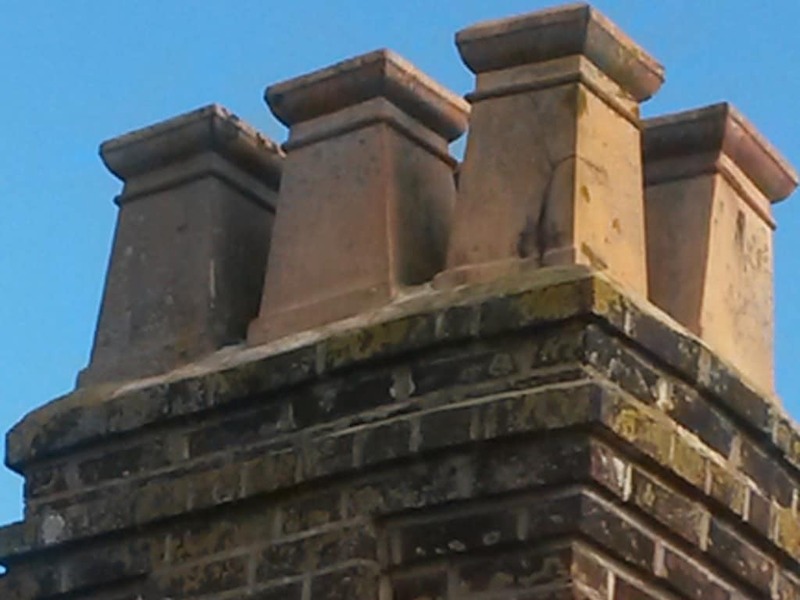 For chimneys that were previously capped but would be better off with a vent it maybe worth looking at a c-cap. There are several things to take into consideration when proofing a chimney against honey bees (or wasps); for example if considering the use of a c-cap you will want to take into consideration the use of the other chimney flues within the stack, and the quality and condition of the brickwork and jointing separating the various flues – it is possible to have a blockage in an open chimney (possibly a birds nest) that pushes the smoke and fumes into the other chimneys thru poor brickwork, and because the route of smoke flow has been altered and slowed it will cool and lead to the possible build up of carbon monoxide (invisible and odourless) in the flue or even a room. We are experimenting with a few ideas to reduce/eliminate the long-term odours and these can be discussed along with all options. 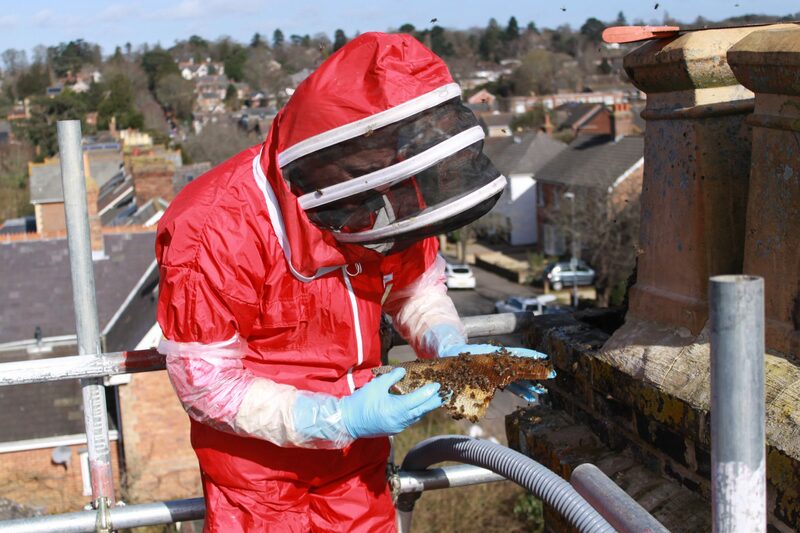 There are many things to take into account when arranging to remove honey bees from a chimney. One of the most important aspects from our side is that of safe access. 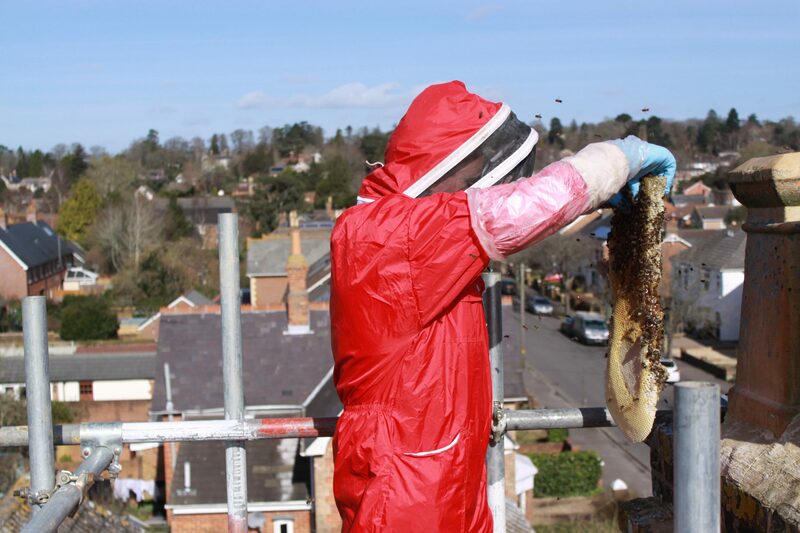 we have carried out bee removal from chimneys using a straightforward ladder and CAT (roof) ladder combination, from a mobile tower, from a scaffold and from a mobile working platform (a cherry picker to the rest of the world). 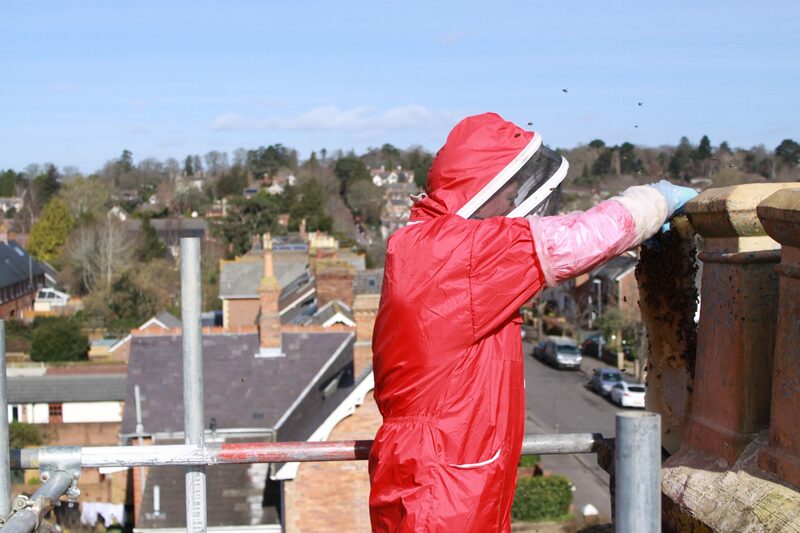 Each chimney bee removal job is different and each has different access requirements. These requirements can be defined by the height of the chimney above the roof, the location of the chimney on the roof, is it central, or offset, is it on a gable end. it will depend upon the terrain around the property, whether there is a conservatory in-front of the chimney, a flat roof and the list goes on. A visual inspection allows us to ensure the work can be carried out in the most efficient safe format possible. We have not discussed all aspects of safety and risk assessment, this is something that will be looked at fully at the time of inspection and at the time of carrying out the honey bee removal. In our climate weather can be a significant factor and can be cause for delaying the job for a period, to be discussed in a different post. We should also advise that using professionals (such as ourselves) is the best way to carry out this type of work. There are not many beekeepers with liability insurance, nor builders or chimney sweeps with the necessary experience to carry out the work. If you are looking for information on removing bees from a chimney check out our top article about ‘Honey Bees in Chimney‘, or if you repeatedly have bee swarms take up residence in your chimney you may want to look at our page ‘Why honey bees like chimneys‘.